← Show Your Support for LOUA! It’s hard to believe that today is the first full day of spring. With temperatures in the 20s this morning, I had on a wool turtleneck, a wool sweater, and wool trousers under a long down coat. And I was still cold! And then there was the snow. As I walked around on campus, I got hit by this rogue snowflake that was huge. It crashed onto my coat and broke apart, it was that big. Funny thing, it was the only flake in the entire sky. And it attacked me – don’t know what I ever did to that snowflake. I like snow. Speaking of spring, as I was driving home from work yesterday evening, I was listening to WOSU and “All Things Considered” that had a story about vernal pools in Ohio and how they managed to survive in weather like this – warm then cold. Of course, I had to call Pete to tell him to listen (calling only when my car was safely stopped at a light!) because I knew how much he’d enjoy the story. 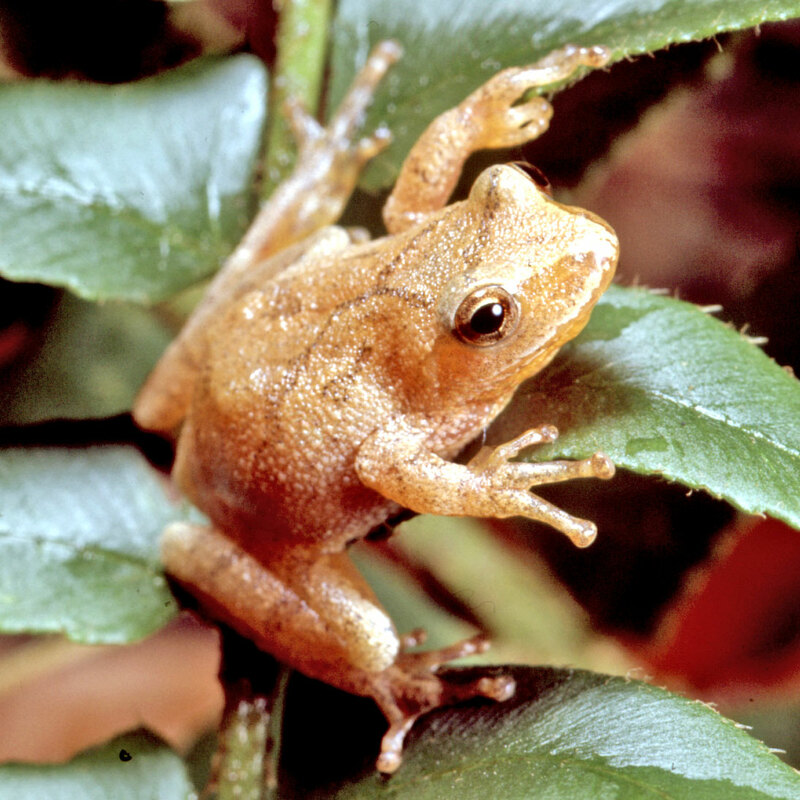 They mentioned Spring Peepers, a frog I’ve only heard a few times. The story talked about how loud they were, that you can hear them from hundreds of yards away. That reminded me of Pete telling me about the frogs in a cistern when he was doing research in the rain forest there. The males realized that if they called from the cistern, their voice was greatly amplified, so they tended to congregate there. Pete said they kept him awake they were that noisy. As for the peepers, I’ve only seen one or two but hear them all the time; they are very small to make such a commotion. The story also talked about leopard frogs that have a bit of yellow on the inside of their legs. Predators see that yellow when they jump high in the air (they can jump five feet! ), then lose sight of the frog so that it appears that the leopard frog has flown off. The frogs also use a zig-zag pattern when they jump to further confuse anything that wants to turn them into dinner. 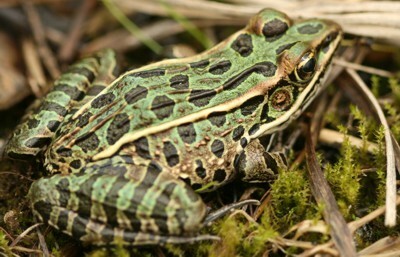 The most amazing thing was the call of the leopard frog; it’s very weird, like a growling purr. Pete had never heard one before; he said he would have remembered if he had. They also talked about what was considered a vernal pool. I found a good definition at the Western Cuyahoga Audubon Society. What’s really important is that the water hangs around long enough for the reproductive cycle of whatever uses it. When I lived in Florida, it rained so much each day that pools would form in the backyard and stay there for weeks at a time. I remember walking around one afternoon, looking at the ground and puddles, wondering what it was wriggling around. On further inspection, it turned out to be tadpoles. Of course, the ones that got stuck in the drying bits of the pools were getting attacked by fire ants. As did I, so that walk was quickly cut short, never to be repeated. I don’t know if those frogs had a quick reproductive cycle or just were confused by the water being there longer than a typical puddle. But soon, the vernal pools will be filled with frogs doing what frogs do. Until then, here’s a little poem to help us keep an eye on the prize: warmer weather and all that it brings! Extra brownie points if anyone can tell me what a “lea” and a “seamew” is! This entry was posted in General Information and tagged leopard frogs, spring peepers, vernal pools. Bookmark the permalink.